Having spent much of the last two days travelling in one way or other, it was nice to finally have a day where we stayed in the same general area. 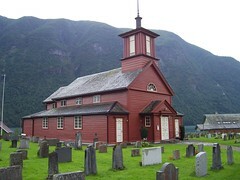 We had four nights booked in Balestrand which meant we could spend a few days seeing and admiring the Sognefjord area. When we’d arrived in Balestrand we’d headed for the Tourist Information office to see what could be done in the area, and in one corner – prominently located – were a series of A4 sheets listing various excursions that could be done. 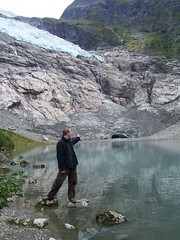 With the Jostedalsbreen National Park on our doorstep, a trip up that way was an inevitability. And so it was that we parted with 455 NOK (about £40) each, and got our ticket for the day. For our money we’d spend 90 minutes on a ferry admiring the beauty of the Fjærlandsdjorden, before disembarking at the town of Fjærland where we’d get on the ‘Glacier Bus’ which would whisk us away to the Norwegian Glacier Museum. After that the bus would take us to not one, but two glacial tongues, before being taken back to Fjærland where we could spend two hours admiring Norway’s equivalent to Hay-on-Wye, before getting back on the ferry again. And so it came to pass that at 0830 that morning, the appropriately named M/F Fjærlandsfjord set off from Balestrand. It was a busy journey, which included two coach loads of American tourists – with only a small car deck, the ferry couldn’t take many more vehicles so it’s perhaps a good job that only one other car wished to join it. As we passed various sights, a commentary was played over the tanoy, telling us about the local villages and summer farms. 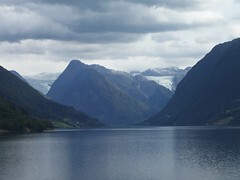 Both sides of the fjord had initially been isolated and inaccessible by road, reliant for many years on the ferries which plied the route. Ferry access began to diminish as the ferries got bigger and were unable to stop at the small quays. With the creation of a road was finally built bear the along the left side of the fjord, the ferry has become a purely tourist resource. 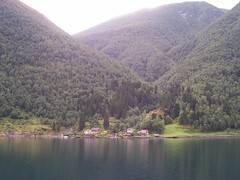 For those summer farms and villages on the right of the fjord, access remains purely by boat. About an hour after we’d left Balestrand, the mighty Jostedalsbreen glacier came into view in the distance – a mighty white glacier straddling the tops of mountains. 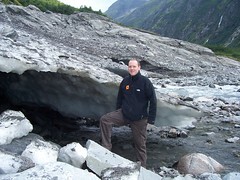 Jostedalsbreen is the largest glacier on mainland Europe, and by all accounts, is over 400m thick in some parts. As two coachloads of American tourists disembarked and headed on their way, the rest of the ferry’s passengers headed towards a lonely looking coach on the harbour front. This is the glacier bus. It said so on the front. Personally I thought it looked just like any other bus, but lets not quibble. For the most part, people had done like us and paid in advance, although one couple paid on board which allowed me a brief wallow in nostalgia. The reason was the ticket machine the driver had. It was an Almex ticket machine where the driver has to manually set the fare, and pull the leaver to eject the ticket. This is less important. More important is the fact that the ticket almost always comes out on yellow paper, and the purpley ink is all smudged! I can remember getting aboard the buses in Manchester with my mum, holding up high my 10p coin and taking that smudgy yellow square in my hands before sitting down, back in the early 1980s. GM Buses started phasing those ticket machines out in the late 1980s, early 1990s, so to see them alive and well in Norway a decade on did surprise me. Indeed it wasn’t the only time we’d see one on our travels. We got to the Glacier museum just behind the other two coaches, which inevitably meant the place was a bit busy. The museum isn’t exactly huge which meant that it was a bit of a squeeze. As well as being a fascinating and informative museum – with everything being in Norwegian, English and (as I recall) German – there were plenty of hands on exhibits too, including the chance to try and drill a hole in the ice (not as easy as it looks – Catherine and myself barely scratched the surface), and the opportunity to try and make what’s known as plastic ice by using a large pump. At the back there’s a recreation of what it’s like to go in a cave under a glacier – not something I’m particularly keen on doing it has to be said. Surprisingly this part of the museum was the one which didn’t seem to get much attention. The major attraction of the museum though was an amazing (and also slightly stomach churning) panoramic video of the glacier, projected over five screens. There were two showings whilst we were there – we caught the second, by which time the two coachloads of American tourists had been whisked off somewhere else having been there little over thirty minutes – nowhere near enough time to take it all in and enjoy it. Thankfully we got around an hour, which thankfully meant less jostling to get a view, and meant we could take it all in. There are two ways to do the Fjærlandsfjorden trip from Balestrand – either as a full day or just the afternoon. In the afternoon, the Glacier bus just visits the Bøyabreen glacial tongue, but the morning bus has extra time meaning that you get to take in Supphellebreen as well. It was to the latter that the bus took us first, and to be honest I think those on the afternoon trips got the worse end of the deal. Supphellebreen you see has one big, distinct advantage. 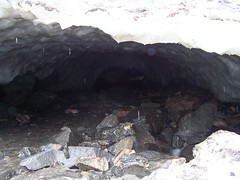 You can get right up to the glacial tongue itself, touch it, and peer inside it. The glacial tongues we visited in Iceland, and Bøyabreen in Norway lacked that advantage – you’re kept well away thanks to a large lake of melted ice at the foot of the tongue. For some reason though, Supphellebreen acted differently. The water simply went on its merry way in a stream. By the way, have I told you all that you should join the flickr pointing group yet? No? Whilst Supphellebreen had the touchy-feely aspect, there’s no doubt that Bøyabreen had the sheer majesty of the occasion. The blue ice shone, majestically, in the intermittent weather. After a good sized stay at each of the two glacial tongues, the bus returned us back to Fjærland in time for it to meet the arrival of afternoon ferry. This left us with just over two hours before the ferry left back for Balestrand. It being just after 1pm, lunch seemed to be in order so we headed into the town to see what was on offer. After about three minutes, we discovered that about the only thing on offer was the one cafe – Kaffistova. Like everything else in the town, Kaffistova also sells books, but it was food we were after. And like the small number of eating options in the town, Kaffistova also had a small number of food options. One to precise. If you wanted savoury, it’s only offer was a cheese and ham toastie. You really do have to wonder about a cafe which can’t even make its own cheese and ham toasties. I mean, how hard is it? Step 1, get to slices of bread. Step 2, get a slice of cheese and put in-between the bread. Step 3, put a slice of ham on top of the cheese. Voila. I mean, I wouldn’t mind if they’d just made their own cheese and ham toasties in advance, but getting them delivered? Hmm. In the end Catherine had one with the ham removed – far from ideal – but to make up for it, we each scoffed down some Norwegian waffles with jam and cream. Norwegian waffles come in a flour shape and are softer than their Belgium equivalents, but for my money, far tastier. After lunch, it was time to peruse some books, so we wandered round endless second hand book shops. In one we got to admire what is probably the largest collection of Mills and Boon-esque books; in another we spotted that the Spanish language books were situated right next to erotica. To be honest, unless you’re the biggest lover of books in the universe, and Norwegian language ones at that, it’s a bit hard work to spend an hour and a half wandering around second hand book shops, which may be why we spent the last forty minutes near the ferry terminal – there being not much else to do. The ferry departed at 1520 leaving us to admire the beautiful fjord scenery again. This time the ferry was far quieter – the two coaches having gone off elsewhere. We sat back and relaxed, enjoying the ride – which included a quick diversion to the side of the fjord to see some eagles in the trees. At 1655 we pulled into Balestrand. As it was Sunday, almost everything was shut so we went back to the hotel and relaxed before tea. If you’re wondering, tea was tomato soup (oddly with half a boiled egg in it), followed by chicken ala orange, rice and a platter of veg for me, whilst Catherine got an apparently very good cheese omelette.